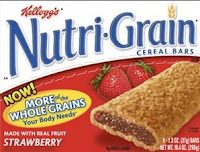 Nutri-Grain Bars only $1 a Box after RRs! Hurry and print out this Nutri-Grain coupon to get a great deal at Walgreens this week! = $2 total or $1 each!